Videos from other bands that Martin has played in (and continues to play in). Dave Warner at the Mushroom 25 Year Anniversary concert. The Flying Fonzarellis film clip, “Stay” Filmed in 1985. Martin is endorsed by Hall & Collins. 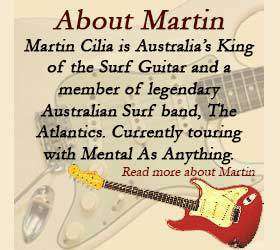 Martin is endorsed by D’Addario.